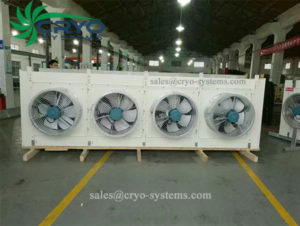 It’s quite easy to design refrigeration equipment for the freezer room and chiller room. We could use monoblock refrigeration units, which is easy installation and no need commissioning. We could also use split systems. Installation is not so difficult and maintenance is very easy, especially we use the semi hermetic Bitzer compressor. We could also use a compressor rack systems. It looks complicated but it’s quite simple and could save power. But when it comes to -50~-60C, we could no longer use same design. DJ evaporator can’t work well and lead to lots of problem. Whole systems need to redesign. The gas, evaporator, compressor, defrost systems, and control panel, etc.